Well something pretty exciting happened today! My phone's notifications started going off like crazy and well wouldn't you know . 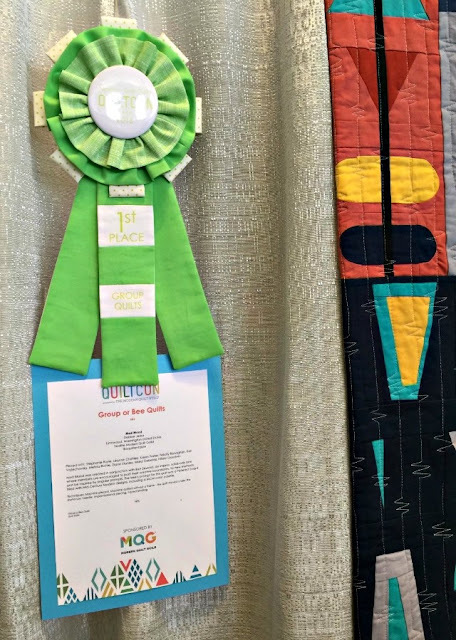 . . Mod Mood had won first place in the group category at QuiltCon! My bee-mate, Stephanie/Spontaneous Threads, was nearby and able to go on stage with Jacquie Gering and acknowledge the award on behalf of Bee Sewcial. Pieced with Stephanie Ruyle, Leanne Chahley, Karen Foster, Felicity Ronaghan, Kari Vojtechovsky, Melissa Richie, Diane Stanley, Marci Debetaz, Hillary Goodwin. Mod Mood was created in conjunction with Bee Sewcial, an improv, solids-only bee where members are encouraged to push their creative boundaries, try new methods, and be inspired by singular prompts. 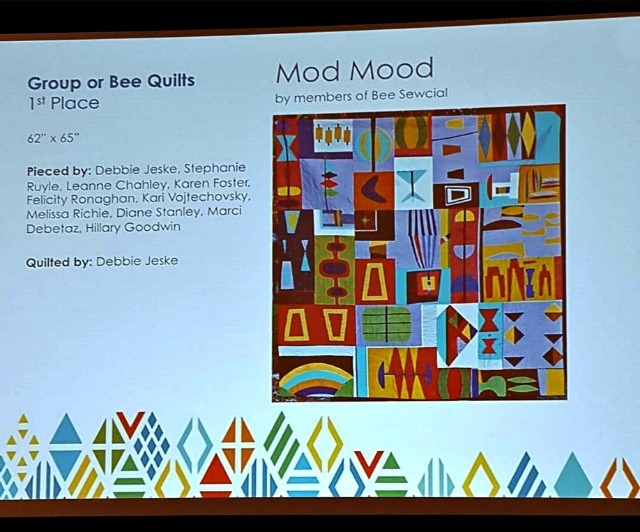 The bee's prompt for this quilt was a Pinterest board filled with Mid-Century Modern designs, including a MCM color palette. Techniques: Machine pieced, machine quilted without a frame - the quilt moved under the stationary needle, improvisational piecing, faced binding. Cool, huh? Wow. I'm still feeling pretty astonished, and now I think I'll go do what I have yet to do today - scroll through Instagram and see what I missed! 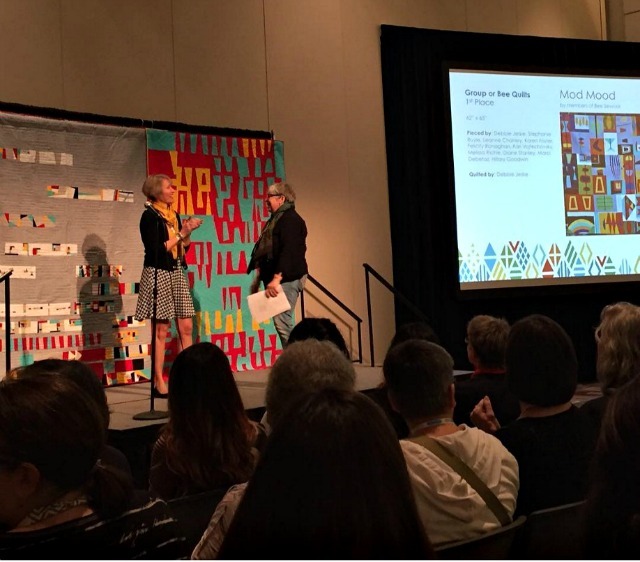 Here's a list of all the QuiltCon 2016 Winners and photos of their quilts . . .
Congratulations, Debbie! So exciting, and so well deserved!! Wonderful news! A very well deserved win for a stunning quilt. I just saw the MQG post!! Congratulations! Congrats.....I'm so excited for you.....I love this quilt!!!!! So happy for you! How exciting!! Congrats! Congratulations, Debbie! Well done. I'm so happy for you! I agree with Teje! It's amazing and it's well deserved!! Congratulations Debbie this is so so great for you and your bee mates! Love this so much! so pleased for you and your awesome bee! This is such a stunning quilt and deserved it's award! This makes me happy! 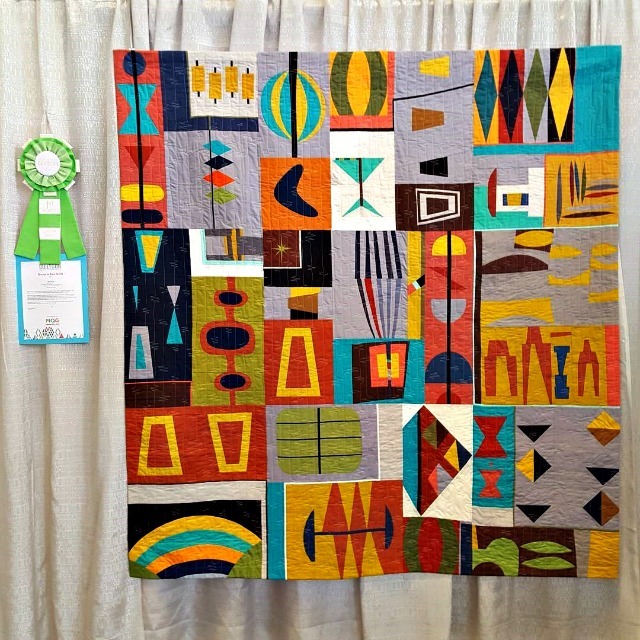 It's an amazing quilt and well deserving of a first place ribbon! Congrats! BIG congrats! It truly is a modern quilt, a landmark, and deserving of this award! Congratulations! Well deserved. I love this quilt! Wow ! Congratulations Debbie for this first place. This quilt really deserves it. Yay for us! So proud to be part of this gorgeous quilt! Beautiful! I love the shapes, colors and movement. Congratulations to all! Sew awesome Debbie~congrats to all, it's a very cool quilt! Congratulations Debbie! I love everything about the quilt! I would love to join a bee like this. Wow - Congratulations! Your quilt is so fun to look at and you did a great job putting it all together. I am so happy for you! Congrats and well deserved! That's so fantastic Debbie! Congratulations to you and your bee mates!! Congratulations to you and you fellow quilters! Congrats! I was excited when I was scrolling through the winners and saw it. Well deserved, it's a great quilt! So excited when I saw your quilt pop up on the awards post. Congratulations!!!! It is a fantastic piece! Congratulations!!! Congratulations Debbie this was a well deserved award for a unique quilt! Oh gosh, Debbie! Look at YOU! From not having put a quilt in a show... to this! How you've grown, and flourished! I am very proud of you. Congratulations, and more congratulations. And a hug too. Congratulations! It really is a stunning quilt! Congratulations! I love this quilt. So glad to see that first place ribbon on this powerhouse quilt. It reminds me of a visit to my Uncle's apartment in NYC in the 60s. I love it! It's even more beautiful in person. So humbled to be able to have my name among the makers. I can't remember if I've commented here or not, but I'm so impressed! Congrats to you and your bee! Such an amazing honor! Congratulations! What a cool quilt! Wonderful quilt! Love the theme. Congratulations Debbie! I loved seeing this quilt take shape here, and then seeing it in person with the rosette at QuiltCon! We missed you there ... Savannah?